Got a client that’s asking if I can make a setup with one computer at the stage running Ableton Live, and another computer at the FOH running VDMX, so he can be able to push the button on the stage starting the music track while also sending a signal (OSC I suppose?) to the FOH computer to start the visuals, and do so with every song. I’ve never really used Ableton. Do you guys have some smart ideas on how to easily set this up? midi thru ethernet could be a solution. Currently running both apps on one cpu but when I can will split on two cpu so will have the same set up. I’m using LiveGrabber 4.1 on my Ableton Mac to sync with video on another Mac and it works well! Within Live, the artist can add an extra MIDI track to their project that is used too specifically send MIDI output to your system. For each slot they can configure MIDI messages that are sent, such as notes and control values. Depending on how they use Live during a performance, they can either directly trigger the slots, or they can place them in specific rows such that they get activated along with master triggers. In this gif I have Live running on the same machine as VDMX, so I can use the ‘To VDMX’ option for sending MIDI, keep reading for the network side of things. 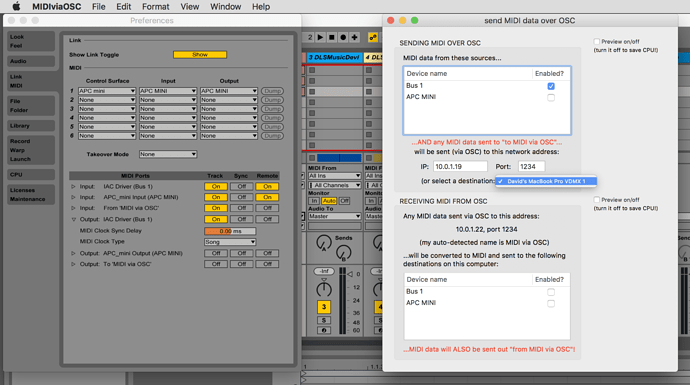 This app will take any incoming MIDI and send it as OSC messages – copies of VDMX on the network will show up as targets, or you can manually configure the IP / port. You can also use this app on the receiving end to convert back to MIDI. Hope those are some useful starting points! I use one extra midi clip / column to send MIDI trigers or something else. Easy And clear solution. Thanks for the answers. The musicians were in a hurry, so we went with a simple midi-track in Ableton triggering the clips in VDMX via the IAC Driver. Again, thanks for the answers. Really appreciate it. Another useful basic trick, which I like to use for a quick setup, is to along with note values also send a ‘sync’ signal as one of the envelope / control value MIDI outputs from Live that goes as a simple ramp from 0 to 1 over the course of a song. Pitch bend works particularly well for this since it is 14-bit resolution. With regard to timecode, there are a few different options and a couple of details to keep in mind. One thing is that ‘timecode’ as a concept usually refers to time in SMPTE clock time. When someone is performing with musical software, such as Live, time is kept track by the number of elapsed measures / beats / sub-beats; the amount of elapsed time in seconds is going to vary depending on the BPM, which itself may vary during the course of a performance. Within VDMX the Clock plugin is used for working with measure time and the Timecode plugin is used for working with SMPTE time. The Cue List plugin is designed to work with either form of time signature. Live supports sending MIDI clock, which can be used to set the BPM and measure time of the Clock plugin. Within the preferences for Live under MIDI, there is an option to adjust the ‘clock sync delay’ on a per MIDI device basis which may help with the latency issue, at least with regard to clock timing? within the MIDI specification there is MTC (MIDI Time Code), however as far as I am aware, Live can only receive MTC, not send it (as far as I am aware… someone please correct me if I am wrong). another popular way to send SMPTE timecode (especially as you get to more pro show production) is a format called LTC which encodes the hours:minutes:seconds:frames into an audio signal – it is a pretty neat idea. While Live doesn’t natively support sending LTC, you can generate LTC audio files (eg http://elteesee.pehrhovey.net/) and then load those into Live as an audio track; this of course requires being able to send extra audio channels from the Live machine to the VDMX machine that aren’t included in the main output, so there is a bit more setup involved here. Thanks for the good answers! Okay now I’m trying to get it to work with LTC with an audio file in Ableton routed to VDMX via Soundflower. By now a clip is set to be triggered when Timecode starts, but I get a bit of flickering in the beginning (see ref. *), and that seems to prevent the clip from being synced with the timecode (approx. 1 sec. delayed). So I was thinking about a solution that would make the clip/video follow the timecode in min., sec., and milisec? Can I somehow use the data from the Timecode plugin as the progress of my video? I was able to trigger the clip using af CS button controlled by the timecode to trigger when startet, but also here, is a small delay. So I would like to synchronise time in Timecode and in the videoclip. What do you mean by “saved every preset with the media playing” ? Ah I see. Thank you. Presets tend to lag if you’re trying to do too much at once. Particularly if you’re stressing your computer with large videos and add/removing a bunch of effects. HAP codec definitely helps if you’re not using it already. so I left the Preset set up, which is pretty cool by the way.